Hi everyone, i am new to the forum but i have read quiet a number of posts here which has inspired to embark on my first electric car conversion, i am a Nigerian and i live in Nigeria, and so the availability of necessary materials or kits tonuse are very scarce and also costly sometimes we rely on importing from USA or China which is usually on high side due to shipping fee and exchange rates. I believe I am 1 of the few people that will dare embark on this kind of project in this country. However, not to bore you with my story, i have been able to purchase 2 dc AMRE motor from a forklift lift repairers, one of the motors is 10kw and it drives the hydraulic pump of the forklift, the second is a 5kw and it is for the traction of the forklift. I was also able to get the 2 controllers which s a zapi FH5082A for the traction motor and zapi F06099 for the pump both of which are series motor. My problem is that i don't know how to connect the controller with the motor, i want to add a potentiometer to the controller also. I have been on the internet for days and it seems there is nothing about these controllers and how to go about its connections. I really need your help on this 3 things, connecting arm to the battery, connecting arm to the motor, connecting arm to the potentiometer to increase the speed and other connections for the display instrument. In short, i will appreciate any information about these controllers and the motor that will lead to the success of my connections. It should contain all the information you need. But don't hesitate to ask if you need help interpreting it, or with any other aspect of EV construction. Hello webar, i appreciate your quick response and I like to tell you that the information is very precise, i have downloaded it and got a quick look into the pages, and page 14 got my attention, the connection to the battery and the outputs, i can only see a negative output that possibly goes to the motor s negative terminal, however i like for to please take a look and confirm where the positive output is. I really really appreciate this information, it is very helpful in my quest thank you so much. 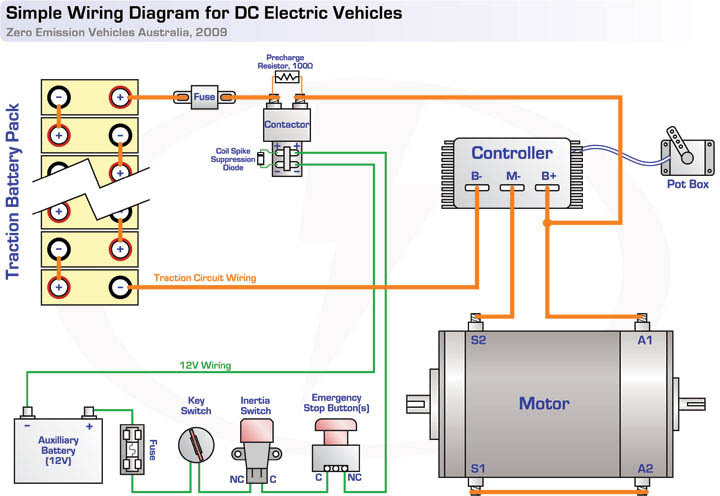 There are other wiring diagrams further down the manual that show connections to the motor depending on what features and model you have. I want to say thanks to all of you, i will try this connections and get back to you guys. Thanks so much.